I'm looking for some help with getting the charging voltages correct for my battery. I recently installed a refurbed 5kw Multi, but have lost the settings from my old 3kw unit. I did inquire with battery providers (now Eco Bat), and they told me the suitable voltages, however, i'm unsure how to set the multi to get to these settings. The batts need to get to 32v, top of charge, but unsure what setting on the charger tab on VEC to get to this. I have tried the preset battery types, but they don't seem to work. Also ticking the traction battery curve, doesn't get them to the right voltage. Can't u access the voltage settings via the victron 've configure software ? And are u sure to charge the brats to 32 v ? Sounds high on a regular bases . I can access via the software, but this is where I'm finding it tricky to get the right voltages. 32V does sound high, but that's what I've been using for nearly 9 years and again was confirmed last week by manufacturer. Just wondering if anyone else out there has a similar set up and what settings on the software they use. That sounds more like a equalize voltage. Hi Billi. They are 7EPZs705 flooded Traction batteries. I would contact the actual battery manufacturer directly. I think I can help with the configuration. It's slightly quirky in the way that you create a custom charge profile. First, select the Charger tab in VE-Configure. 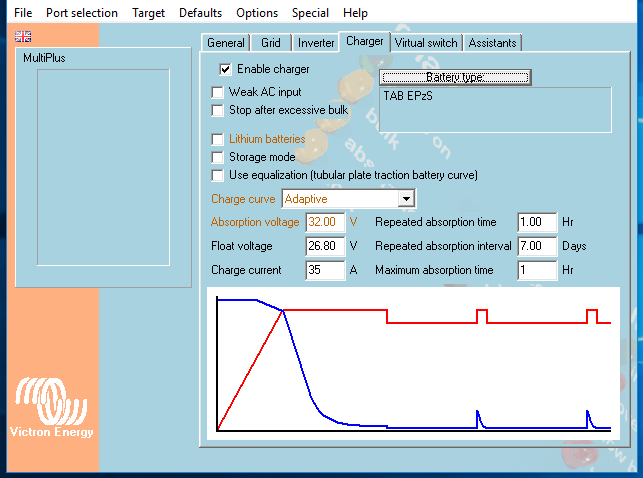 Just above the graph, you should be able to type in the voltages which correspond to your battery parameters. Note, as soon as you select the boxes on this page, another box pops up. 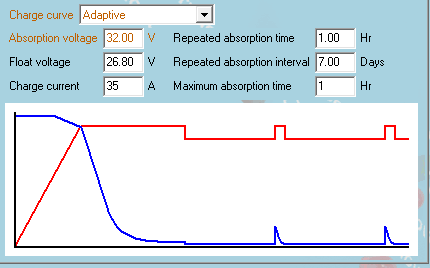 The pop up box gives you information on the minimum and maximum values that can be applied for the particular parameter. Type in your values in the box and Select "OK". You'll see any altered values highlighted on orange on the main "Charger" tab. 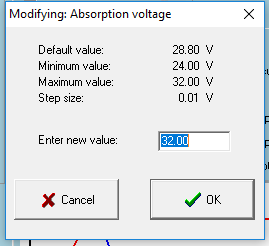 In my example I have altered the Absorbtion voltage value. 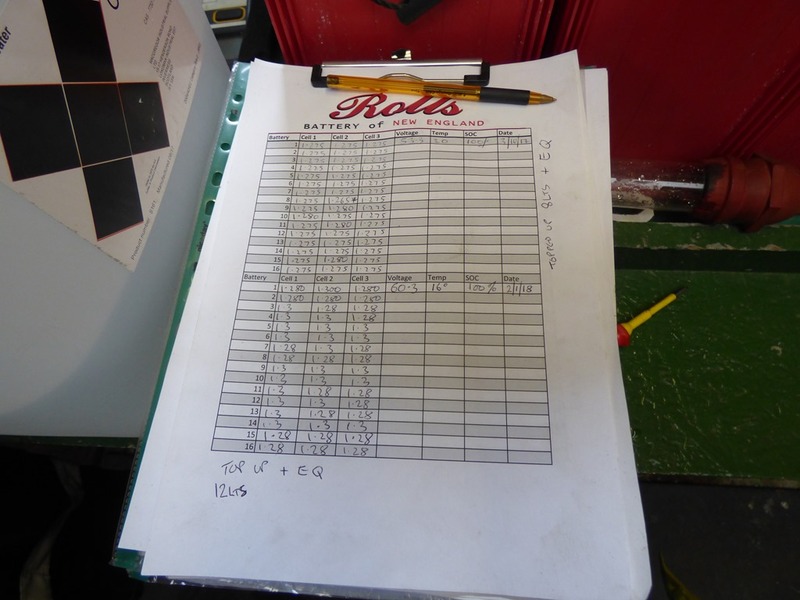 Once you have all of your parameters set to the appropriate values, you then need to apply them to a battery type. At the top right there is a box which displays the battery type. It should say "No corrosponding default" if you have applied your own parameters in the previous step. Click on "Battery type:" and you'll be presented with another window entitled "Please select battery type". The "No corresponding default" button should be automatically selected and greyed out. Here is where you click on the third button down on the left, "Create new type"
A confirmation window will pop up. Click on "Yes". You'll then be presented with a window in which you can type in a name for your battery type. Click OK when you are ready. 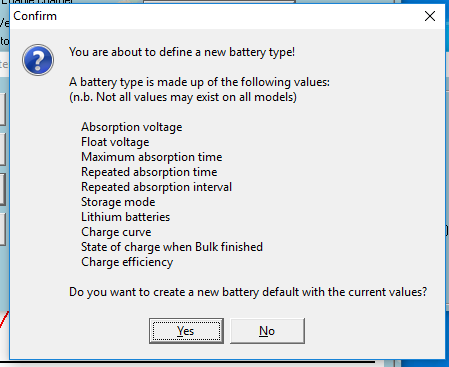 You are then sent back to the "Please select battery type" window where your newly created battery type should be selected at the bottom of the list. Click the OK button. You'll then go back to the main "Charger" tab. Your parameters should all be correct and your battery type will be displayed at the top right corner. Finally, click on the "Send settings" button at the bottom left of the window to program the settings into the Multiplus. (The "Send settings" button is not present in my example because I am not connected to my Multiplus, I'm running this example from a previously saved configuration file). I hope this information is what you were after. .... i personaly question the 32 Volt setpoint in an off grid cenario , it might be diffrent for fast charging forklift ideas , where the night is too short to fully charge the battery before the next shift starts , i would not set my PV to 32 Volt charging on a daily bases ! Methinks that kind of setting would be OK for a generator only set up where you're not doing a full charge/discharge cycle. Seems awfully high for an RE setup and I'd be questioning it's use on a solar charge controller. Methinks you would go through an awful lot of water using those voltages. I thought my settings were high at 60v float and 62v EQ, I go through 12lts water every three months. Thanks very much for all that info. I think I'll need a wee while to digest it all before i get back to you.